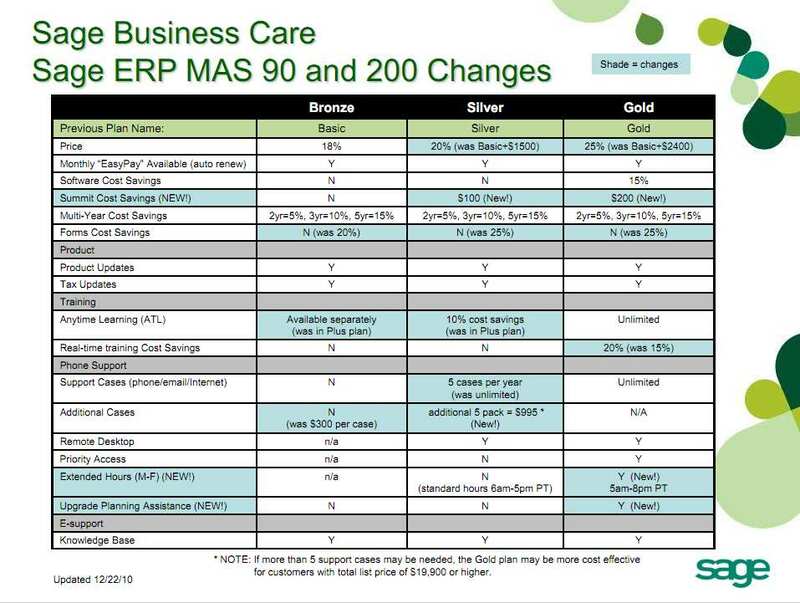 What Are The New Sage ERP MAS 90 and MAS 200 Maintenance Plans? Sage have just rolled out a completely revamped line of support plans for their Sage ERP MAS 90 and 200 accounting software. – Users who purchase over 5 users prior to 2003 and were grandfathered will begin to pay a per user license fee on licenses in excess if the initial 5 users – starting April 2011. 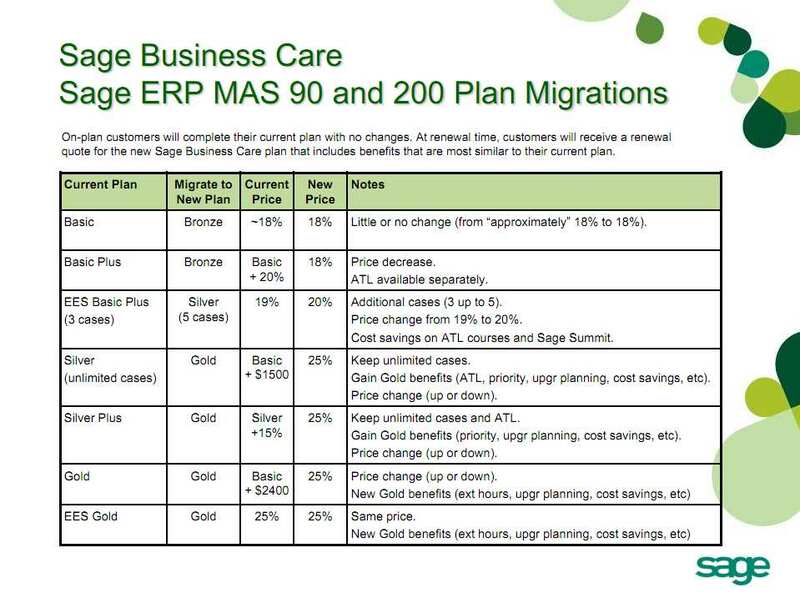 Since maintenance plans have changed – Sage will automatically update existing users’ plans according to the chart below so that the benefits and features remain similar. If you have questions on how your Sage maintenance plan is calculated please contact your Sage Business Partner for assistance or you can also call the phone number listed on your Sage renewal and ask for them to provide you a breakdown of costs. 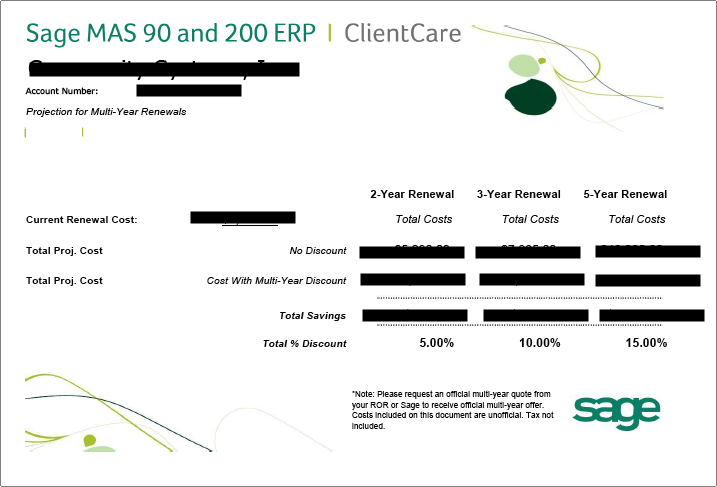 I received this notice yesterday from a client who received an offer from Sage to renew their MAS90 Basic Maintenance on a multi-year contract at a discount. First noted in August, this promotion apparently is perpetual and continues to allow Sage users to obtain 5, 10 or 15% discounts on Basic Maintenance or Support renewals. 2. Cannot use any payment plan (aka Easy Pay) to get the discount – must pay the whole amount in advance. 3. Can be used on either Basic of Basic plus Phone Support (prepaid plan). 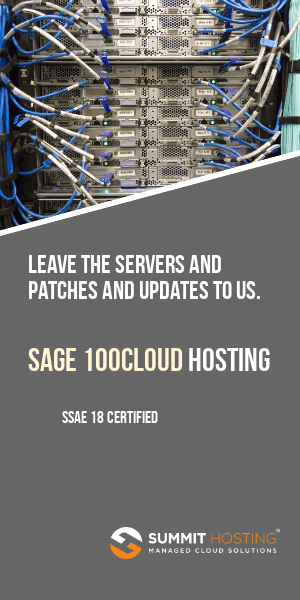 Contact your Sage Business Partner for more information about how you can save with a multi-year Basic Maintenance renewal.